"Everybody's got something they're hiding." Showtime has debuted the first official trailer for Listen to Me Marlon, the fantastic new documentary from Stevan Riley profiling the life and mind of legendary actor Marlon Brando. This documentary delves into the mind of Marlon using his own audio recordings, his own voice, to tell you the story of the real Marlon Brando, who he was, why he didn't like the spotlight, the family he raised. It's a wonderful documentary (I first saw this at ND/NF) that really gets into his mind, deep into who he is and explores a side of him you've never seen before. Whether you're a fan of Brando or not, this is a fascinating and must see doc. Start with the trailer and be sure to catch it when it's in theaters. With exclusive access to his extraordinary unseen and unheard personal archive including hundreds of hours of audio recorded over the course of his life, this is the definitive Marlon Brando cinema documentary. Charting his exceptional career as an actor and his extraordinary life away from the stage and screen with Brando himself as your guide, the film will fully explore the complexities of the man by telling the story uniquely from Marlon's perspective, entirely in his own voice. No talking heads, no interviewees, just Brando on Brando and life. Listen to Me Marlon is directed by Stevan Riley, and first premiered at the Sundance Film Festival and playing at New Directors/New Films, Hot Docs and AFI Docs. 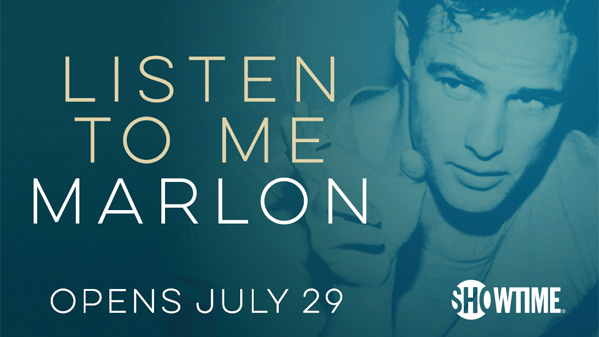 Showtime will release Listen to Me Marlon in theaters starting July 29th this summer. It's a must see doc. I'll definitely keep my eyes on this one! I just watched the Kurt Cobain doc, this seems like the same formula added to Brando. Could we be starting a new style of biography documentaries? Also, is it just me or the sound is completely messed up in this trailer? What a voice Brando had! It was so unique. I don't think there is another actor alive that can match his timber! Looks great. Poor man, he so longed for his fathers approval.